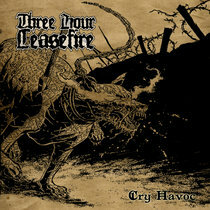 Three Hour Ceasefire is a sickening death metal band from Ireland signed to our buddies over at Savour Your Scene. With some hard moshing tracks and tasty riffs Three Hour Ceasefire are simply fun to listen too. Their crazed sound is oftentimes reminiscent of Bolt Thrower and their solid production does wonders for their overall appeal. Whats nice about Three Hour Ceasefire is that they have essentially their own sound, a sort of mix of thrash and death metal with the occasional touch of black metal thrown in for flavor. The end product of this bands efforts is a very tasty chunk of heavy metal magic, something that should have appeal to many metallers across the globe. In short, Three Hour Ceasefire is a very strong band, and I think with a bit more development of their sound these guys could get signed and tour the globe! Check out more stuff from their label!